What is the best way to promote tree root growth in the soil under a sidewalk? It’s a question that landscape architects, urban planners, arborists, and related professionals from cities large and small have no doubt considered. A study being conducted by Bartlett Tree Experts, a third party tree research laboratory that performs various tree related studies, is comparing the effects on tree growth of various hardscape soil treatments. The applications in this joint research experiment tested two different soil cell products and two different structural soil mixtures in controlled plots, with astounding results. Tulip poplar trees were planted in two parallel 90 foot trenches, two feet deep and five feet wide, duplicating a city sidewalk. The trench was lined with Typar fabric to restrict root growth from encroaching outside of the intended trench. Wood barriers were constructed at five foot intervals to hold the fabric in place and separate the plots. Each plot contained approximately 42 cubic feet of soil, similar to what might be anticipated for a city sidewalk. The plots were filled and compacted as noted above, and trees were planted in July 2014, and repeated six times, three per row, in a randomized pattern. A concrete walkway was then poured over the test plots to replicate a city sidewalk, with a hole left in the middle of the plot to accommodate the tree’s trunk. After one year, the initial tree growth data was collected and the tree height, diameter, condition, dieback, and leaf color were all measured. Leaf moisture and chlorophyll fluorescence were also determined. The first year’s growth indicated the startling results indicated in the abbreviated list below. The results were calculated by measurement of each of the six soil treatments. The height and spread diameters clearly illustrate that soil cells significantly outperformed all the other methods, with StrataCells showing the most tree growth. The speed at which such drastic results have been determined is of great interest to the research, since other studies performed by Bartlett Tree Experts has taken numerous years before significant results started to show. Dr Thomas Smiley, an Arboricultural Researcher at Bartlett, directed the research which was originally intended to be a five to ten year study. However because of significantly obvious results after just one year, a much faster than expected conclusion has been made and the study has been condensed. Soil cells manufactured by GreenBlue and our affiliate companies are the world’s only large soil cells made from 100% recycled plastic. They can be stacked to various heights and cut to shape during construction, as required. StrataCells are one component modules that clip together to form a skeletal matrix that is filled with soil to provide uncompacted rooting volume for trees. They can be spread laterally as wide as necessary including under vehicular traffic areas with minimal surface coverage. Soil cell matrices are stacked on a hard surface at the base of the planting pit. The weight of the paving and any surface loading is transferred downward through the cell structure to the compacted base at the bottom of the tree pit while the soil within the cell structure remains uncompacted to allow for healthy tree root establishment. 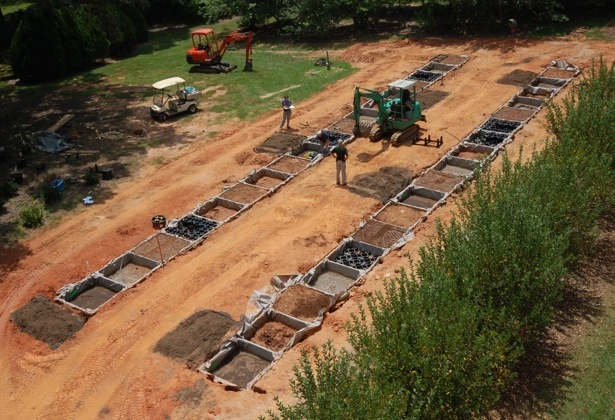 Utilizing soil cells for tree planting also provides a stormwater treatment function. Rainwater runoff can enter the system through pervious paving, drains, catch basins, and the opening around the tree trunk. GreenBlue soil cells support paved surfaces of any kind and can meet AASHTO H-20 loading requirements with proper engineered surfaces above. Irrigation and aeration systems, as well as local utility ducts, can be integrated into the soil cell layout. Since this study is ongoing, the final conclusion is undetermined. However, as previously stated, the photos tell most of the story and after just one year, soil cells have proven by far to be the best option for planting trees in hardscape surrounds.